Each year, Democrats Abroad Switzerland holds an Annual General Meeting (AGM) with the purpose of bringing new and old members together and celebrating our community of American Democrats in Switzerland. After the official business of DACH officer reports, we will enjoy a potluck meal together, discuss the importance of the upcoming primaries and listen to you – to learn what issues are important to you and how we can make our organization better. Did you know DA is a volunteer run organization? Would you like to get involved? Interested in finding out how to organize events in your community? We would love to hear from you and hope you can join us at the AGM! The 2010 AGM has been scheduled for Sunday 13 June and will be held in Nyon (VD). We are working on an interesting program for you and will share details with you shortly. For now, please mark your calendar to join DACH in Nyon from 1pm to 4pm. Join Democrats Abroad and you will be enrolled in your resident country mailing list. Go to DemocratsAbroad.org/join or click the button below. 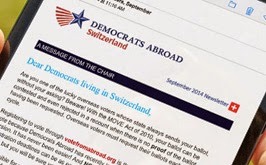 Democrats Abroad Switzerland (DACH) is the country committee connecting Americans in Switzerland on issues that affect them and how to Vote from Abroad. DACH is open to any U.S. citizen of voting age residing in Switzerland and border cities. © 2016 Democrats Abroad Switzerland. Awesome Inc. theme. Powered by Blogger.